Hilda (Baptista) Pacheco 93 of New Bedford passed away Monday December 3, 2018, at St. Luke’s Hospital. She was the wife of the late John C. Pacheco and daughter of the late Manuel and Rosa (Quintal) Baptista. She was born in New Bedford and was a lifelong resident. Hilda was employed as an inspector for Calvin Clothing until her retirement. Survivors include her daughters, Elsie Ponte of New Bedford, Rosa Houtman and her husband Robert of New Bedford, Maria Isabel Soares and her husband Tony of North Dartmouth. She is also survived by her brother Joe Baptista of Georgia, 3 grandchildren, 7 great grandchildren and 1 great-great-grandchild. Also many nieces and nephews. 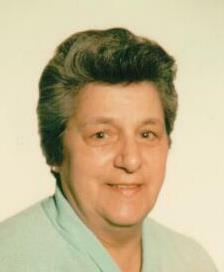 She was the mother-in-law of the late Gilbert Ponte. Her visiting hours will be 9-11am on Thursday December 6.Followed by her service at 11am. Burial will be in St. John’s Cemetery.